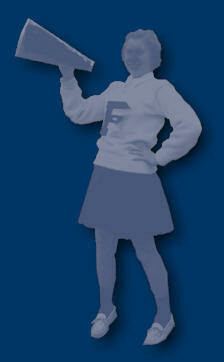 The ‘3A’ and ‘4A’ designation is based on school population with ‘3A’ being schools with 300-799 students and ‘4A’ those with over 800 students. Wetaskiwin Composite High School’s population in 1990 was just under 800. Very few schools “opt up” to a higher division, especially from ‘3A’ to ‘4A’ as this means competing with Edmonton and Calgary High Schools many of which have over 2000 students and thus more athletes to choose from. 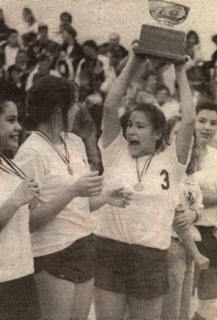 As the 1990 season unfolded the girls seemed to play better and better and the momentum grew. The Sabres won the North Battleford, Lacombe and Leduc tournaments. As well, they placed second at two of the most well known and prestigious Edmonton tournaments, the Jasper Place Rebel tournament and the Harry Ainlay Triprov Tournament, both of which attract high caliber ‘4A’ level teams from Alberta and other western provinces. Their achievements at these two tournaments gave the girls confidence that they could be competitive at the ‘4A’ level. In tournament play team members from the Sabres were regularly named tournament all stars or MVP’s. Regularly Named Tournament All Stars or MVP’s. Taking the dream one step at a time the girls won their league and then journeyed down to Medicine Hat to the Zone Championships and then won there too. The last hurdle was the Provincials. 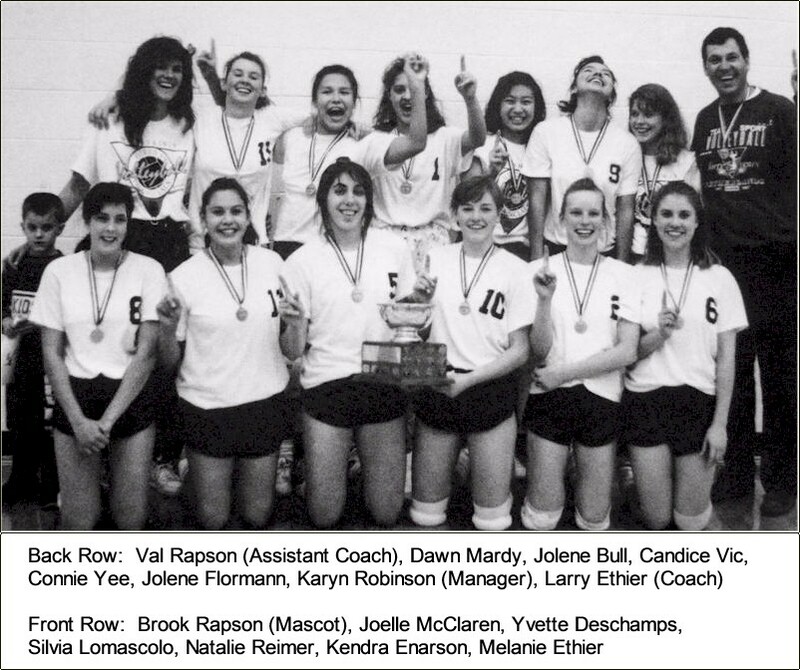 Wetaskiwin was lucky enough to host the Provincial Championships and on November 23rd and 24th, eight teams from across Alberta migrated to Wetaskiwin Composite High School in hopes of going home as the ‘4A’ Girls’ Provincial Volleyball Champions for 1990. After a rousing opening ceremony including a Piper for the march-on and a visit from the Captain of Team Canada, the combatants took to the court in pursuit of a new championship. 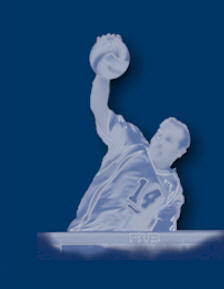 The play was excellent and resulted in some very intense and exciting volleyball. The second day brought even more intense competition with Wetaskiwin, McNally (Edmonton), Sir Winston Churchill (Calgary) and Grande Prairie surviving and advancing to the semifinals. Leduc, Lindsay Thurber (Red Deer), Western Canada (Calgary) and Salisbury (Sherwood Park) had to watch and cheer on the other teams. The semifinals provided great action with McNally finally bowing out to Sir Winston Churchill and Grande Prairie succumbing to Wetaskiwin. With great support from the school and the community the Sabres were able to make the dream a reality. 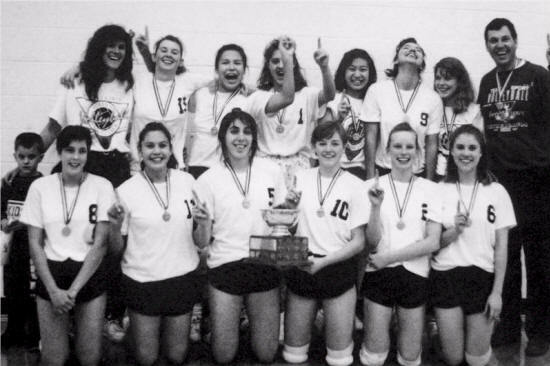 The girls edged out Sir Winston Churchill for the gold medal and achieved success at the highest level available to them by winning the Provincial ‘4A’ Volleyball Championship. Wetaskiwin became the ‘FIRST’ 3A school to win the ‘4A’ Girls’ Volleyball Provincials, an amazing feat. For any team to win a Provincial Championship, the “stars have to align”. It requires belief in and commitment to your system, team-mates and coach; goal setting; focused practice; hard work; high level physical conditioning; good coaching; being able to play your best under extreme pressure; exceptional comradeship, teamwork and co-operation, and of course outstanding ability. This Sabre team of 1990 was special, they “had it all” and proved that anything is possible. The championships they shared will last a lifetime. Six of the team members from 1990 went on to win the 1991 ‘3A’ Provincial Championship capping off three incredible high school years. They certainly set a record for Sabre teams in the future to aspire to and their accomplishments make them a deserving team to be inducted into the Wetaskiwin and County Sports Hall of Fame. 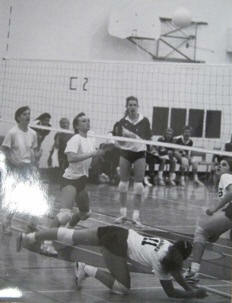 Some teams members went on to play for Alberta Volleyball Association elite midget and juvenile teams and one player also continued playing after high school at the University level and was named “the most outstanding female university volleyball player in Canada”. Information about an inductee is collected from published sources, sports archives, scrapbooks, anecdotal information from family, friends and fans, and the athletes, coaches and managers. Read the acceptance speech made by one of the players Kendra Limneos (Enarson).